I love the Netflix show – Stranger Things. 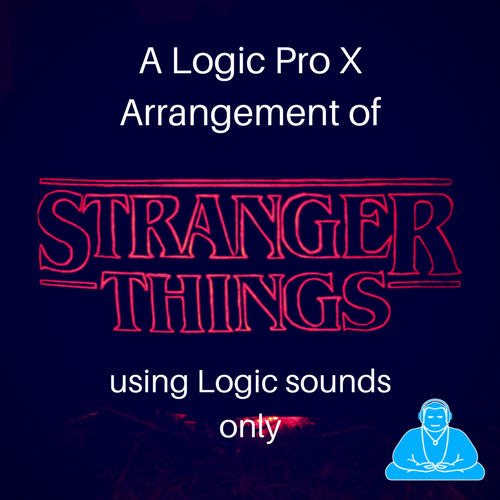 I particularly love the music, and so I decided it would be a good idea to try and recreate the Stranger Things theme tune just using Logic Pro X sounds only. ‘That will be easy’ I thought. ‘It should only take me a few hours’ I said to myself. It turned out that the theme tune is like the Rabbit Hole in Alice in Wonderland. The more I listened to the track, the deeper and layered it became. Four days later and after many hours of scratching my head and feeling in awe of the task at hand, I finally managed to get something that I was happy with. The track makes use of multiple layers of synths, some retro and some more modern. The new Alchemy synth in Logic Pro is the new Daddy synth for Logic, and was the goto place for the many textures needed. The Retro Synth also came in useful, particularly with the FM Synthesis parts. The main things to contend with was the enormous amount of automation needed to replicate the evolving nature of the track. It can really get messy if you are not careful. I alway leave the volume automation last, so as not to make balancing levels too awkward. After I put my recreation on youtube, I started to get requests for a tutorial to show how the track was made. To be honest, this track was HARD, and a tutorial would take too long too produce, and would probably make my head explode in the process. So I’ve decided that a compromise would be to make the Logic arrangement available for purchase, and let those who want to work it out for themselves. All the sounds used, plugin settings, automation, arrangement and mix settings are all there for you to explore and try and understand. Of course, I am always open to answering any individual questions about the arrangement that you may have, but you would probably get more out of it if you discover the processes yourself (like I did!). If you have suggestions for tracks or piece of music that would be interesting to recreate then please, get in contact.